The recent protests against the destruction of the national park in Bulgaria’s Pirin mountain reveals the relation of forces in Bulgaria’s green movement. The “Capitalism Kills!! !” placard with “Pirin” added to it to make it acceptable. Plovdiv, 11 January 2018. Source: the authors. The start of Bulgaria’s EU Council presidency on 11 January 2018 put the country into the focus of European public opinion. As usual, the spotlight was on the progress of Bulgaria’s integration into the EU and, unsurprisingly, on the ‘cloud of corruption’ hanging over the country. While PM Borisov obediently promised to tackle this issues within the next two to three years, people across Bulgaria took to the streets, seizing the opportunity to attract international attention for a number of causes. 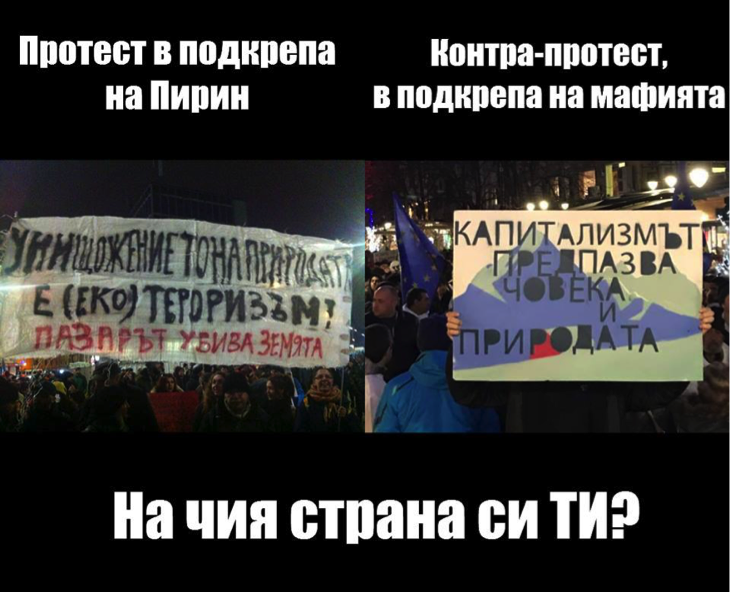 The largest attendance and biggest publicity was drawn by the protest ‘“For” Pirin’ (“Za” Pirin), organized by a coalition of green NGOs and supported by the ‘Zelenite’ party (‘The Greens’), the right-wing ‘Da, Bulgaria’ (‘Yes, Bulgaria!’) and ‘Demokrati za silna Bulgaria’ (‘Democrats for strong Bulgaria’). Protesters demanded the repeal of a parliamentary decision sanctioning the development of 48 per cent of the territory of the Pirin National Park, including the construction of a second ski lift gondola in the winter resort Bansko. Including demands to dismiss the responsible minister and to put an end to the influence of oligarchic and business elites in the plundering of a UNESCO natural heritage, the protesters clearly positioned themselves within the well-established anti-corruption discourse invoked by Borisov and EU leaders. It is still unclear, however, what potential this movement has to change the ongoing social dynamics in Bulgaria and what is its relation to the neoliberal transformation of the country and its devastating effects. And, conversely, what is the role – and what are the potential options for action – of left-wing initiatives in this protest wave? “Capitalism kills!” doesn’t kill, or does it? Ahead of the country-wide protests ‘“For” Pirin’ on the 4th of January, the organizers stated that the event would be open for ‘all citizens with a cause, who want to change their future for the better’. 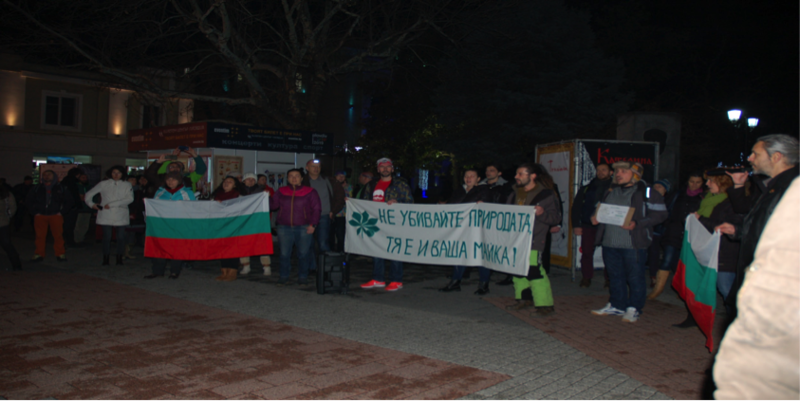 The protest thus appeared to welcome people from a wide political spectrum under the common goal of ‘saving Bulgarian nature from the greedy hands of corrupt elites’ through active citizenship. This stance and the proclaimed slogan “Unity makes strength!” appeared to encourage the mobilisation of different social groups with a broad range of interests: from routine-attendees like middle-class urbanites, environmentalists and intellectuals to patriotically-inclined workers, pensioners and disquieted citizens. This impression of a united protest did not last long, however. Already when leftist groups joined demonstrations in Sofia on the 4th of January, bearing slogans such as “Capitalism kills people and nature”, they were met with great derision on social media, where they were accused of being provocateurs who should be removed from the demonstrations. This threat materialised one week later in Plovdiv in an incident which we have discussed in more detail elsewhere. When we raised our own “Capitalism kills!! 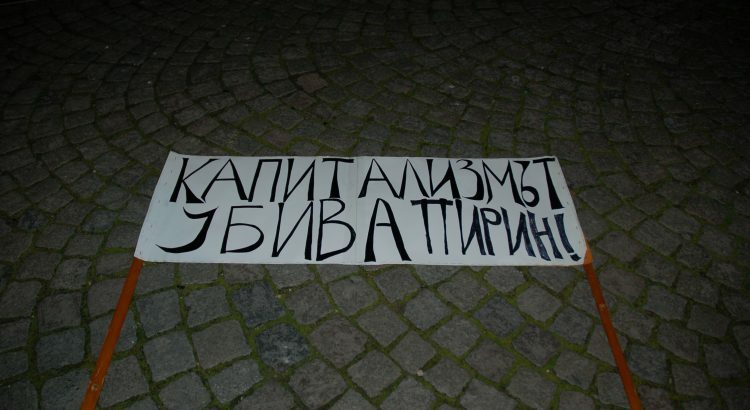 !” placard on the city’s Saedinenie (Unity) square at the start of the ‘“For” Pirin’ protest, its organizers immediately asked us to take it down, as they considered it provocative, contradictory and damaging to their ends. Their subsequent requests that we march silently, or solely with posters handed down by them, or that we leave the demonstration altogether, demonstrated that they were mostly preoccupied with maintaining the external appearance of the protest as free from anti-capitalist “ideological propaganda”. Even after changing the placard to “Capitalism kills Pirin!”, as agreed with one of the organizers under the eyes of the ‘mediating’ police officers, we failed to appease the entire collective, some of whose members kept complaining about our presence. At the very end of the protest, the police, incited by event organizers, forcefully removed us from the event site, and only our cries for help saved us from experiencing more violent measures. This demonstrated, in a worrisome manner, how green and eco protest initiatives are ready to collude with law enforcement to delineate their demonstrations against any perspectives considered too leftist or otherwise too radical. The demands of the protest are clear and specific and are three in number – revocation of the decision taken during the holidays; resignation of the lying and incompetent minister Dimov; and exposition of the ownership of the main investor. All attempts for ideological free-riding from communists/capitalists/anarchists will be considered a provocation and an attempt to create divisions and sacrifice the cause for Pirin for petty populist dividends. In this way the organizers tried to distance themselves from any ideological framing of the protests and to present the case of Pirin National Park as the one and only issue at stake, upon which political decision makers should act morally and according to the will of the people. These demands were underscored with accusations that the ‘mafia’, ‘corrupt’ politicians and ‘people with big money’ were involved in the construction projects and should be disengaged from the process. These actions indicate a worrisome tendency in the protest ‘“For” Pirin’. The ‘greens’ and other initiative groups refuse to acknowledge and tackle the force driving the construction projects in The Pirin National Park: namely, the privatisation and utilisation of natural resources for the interests of rent extraction and capital accumulation, from which only a few economic elites are to benefit. On the contrary, protest organizers in different Bulgarian cities decisively maintained that they were “not against capitalism” and that “capitalism isn’t the problem”. With the above-mentioned chants and slogans taken from the widely circulating anti-corruption discourse, the protesters nurtured the idea of bringing about a more pure, non-corrupted capitalism through a vibrant civil society that keeps in check corrupt business and political elites. The pro-capitalist, civic positioning of the protest ‘“For” Pirin’ is reflective of the trend that ecological and urban protest movements more generally are following in Bulgaria in recent years. Already in 2012, environmental protesters and ecological activists demonstrating against the Forestry Act and shell gas fracking refrained from expressing any solidarity with different workers’ strikes and a mass mobilisation against electricity price hikes. In 2013, this division took on an explicit class dimension when urbanite anti-corruption protesters claimed a ‘revolt of reason’ morally superior to the ‘revolt of the masses’, who allegedly lacked the sense of citizenship, entrepreneurial initiative and education to lead an economically secure and dignified life. In this sense, ‘green’ and other protest movements appear to be substantially detached from the interests of a majority of Bulgarians who are still struggling with neoliberal reforms. As Traykov and Dinev have argued, it appears that ‘green’ and other liberal centre-left protests embody, more than anything else, the ideology of the ruling class. That they do so by invoking the well-established narratives on anti-corruption should not cloud our understanding of the ultimate ends of this alliance. In Bulgaria ‘anti-corruption’ has become part and parcel of capitalist ideology and its Western-centric ethos, suggesting that by weeding out the ‘bad apples’ it is possible to perfect the system. The reproduction of this vocabulary sustains the utopian image of ‘pure capitalism” as a system that guarantees progress and material wellbeing while criticising all actual manifestations of capitalism in Bulgaria as capitalism of a Balkan type – distorted by the Oriental mentality of the masses and the grip of a corrupt communist elite. Paradoxically, by embracing this position the ‘Greens’ and their allies ultimately occupy the same ideological terrain as their alleged enemies – big business, investors, and power-holders who endorse the construction work in Pirin National Park and put forward slogans such as ‘Capitalism protects people and nature’. Even if they claim to rule out the capture of their protests by ‘capitalists’ (see the quote above), they end up as silent collaborators in the defense of a capitalist regime which leads to the daily loss of human lives: the lives of workers falling victim to work accidents and blatant exploitation: the lives of the sick who are denied treatment or cannot afford medicine; and the lives of those struggling with hunger, cold and natural disasters. At the same time, any critique of the economic system as corrupted and pernicious to both nature and human existence is smothered and denounced as ‘communist’ or ‘anarchist’ provocations. Like everywhere across Eastern Europe, it has become not only acceptable but in fact mandatory to sanitise public discussion from critical (or in fact any) references to capitalism as a mode of social organisation, and by proxy, from any references to leftist agendas on social justice, dignified labour and social welfare. As we showed above, the organizers of ‘“For” Pirin’ knew these rules of the game all too well and did not exhibit any qualms in cynically instigating the police to remove those who could have spoiled the picture. These recent events have highlighted some of the challenges that the left in the region faces at the moment, namely: How to leave the comfort zone of intellectual debates and mobilise people among the working class and rural populations? Should cooperation with other social movements and initiatives be sought or should more singular, decidedly anti-capitalist efforts be undertaken? How to react to the demonisation of leftist activism as shameful remnant of the ‘communist’ past? So far, two positions can be identified for the Left to move forward. The first is one of non-interference, ranging from different modes of cooperating with the ‘Greens’ and other platforms in support of the protest ‘“For” Pirin’, or alternatively abstaining from the protests altogether. This stance has its merits especially when considering the overall goal of effectively challenging the ongoing efforts to execute the construction plans for the National Park and the positive momentum that activists could generate through a victory on this front. On the other hand, this cooperative and lenient position also serves to leave unanswered and unchallenged certain statements made by ‘Green’ protesters and the liberal-centre-right ethos of the demonstrations ‘“For” Pirin’. The first, more immediate implication of this more ‘cooperative’ stance is that by toning down the language of protest and silently joining the centre-right organizing coalition on their terms, left activists endorse the latter’s consensus, according to which capitalism is only to be corrected for its nature-damaging effects but not be questioned in and of itself. If the left tacitly allows the usurpation of social discontent by such hegemonic anti-social and pro-capitalist rhetorics, wouldn’t it get caught up in the contradictory and exclusionary logics of the centre-right protest coalition outlined above, thus distancing itself from the people whom it should be defending? Is this settling for a strategic alliance in a ‘small battle’ not short-sighted given the likely prospect that even if the demands of demonstrators are met, new political personnel and amended agendas can revert back to the same old regressive actions in the long run? A more decisive and radical leftist stance would suggest separate protests against the construction plans in Pirin National Park and the business and capitalist interests behind them, based on a more explicit critique of neoliberalism and its exigencies. Embracing this position would enable the left to reframe the protest in a vocabulary that has so far been taboo-ed in the post-1989 public discourse. It would allow to challenge the false associations of left protest with the communist past drawn by different people at protests and in social media. The recent demos have once again highlighted that it is high time to dismantle this myth which has continuously served to marginalise and ostracise left activism in the eye of many people and remains a key element of neoliberal ideology in Bulgaria and Eastern Europe more generally. Another decisive element of this strategy could be the unequivocal distancing from today’s Socialist establishment – specifically the Bulgarian Socialist Party (BSP) – and its neoliberal clientelist politics. Left critique and activism need to be constituted independently of the political networks and ideological repertoires of this party, which is by now delegitimised in the eyes of many. This will enable efforts to reclaim the right to speak on issues of social justice and workers and to link the protests for Pirin with social problems such as exploitation, inequalities and economic slavery. Such strategy would not be without risk especially for people taking the responsibility and action to articulate and execute it. On the other hand, the positions and statements of the ‘Green’ and centre-right protesters ‘“For” Pirin’ appear, as we have shown, too naive, exclusionary and simply untenable to accommodate them with principled leftist activism. The protest wave around the Pirin National Park question may pass before a definite position on this is formulated within the left. The questions that these protests have thrown up about the implications of the left’s involvement in contemporary social activism, however, will remain to be answered. 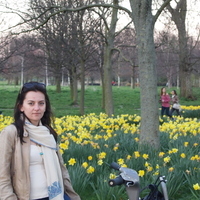 Polina Manolova is has a PhD in Sociology and Social Anthropology, University of Birmingham. Her research interests lie in the field of migration with a particular focus on individual motivations, global social imaginaries, and living and working experiences of migrants in urban post-industrial centres. She is further interested in everyday experiences of postsocialist transformation and global capitalism in the context of Eastern Europe and Bulgaria in particular. 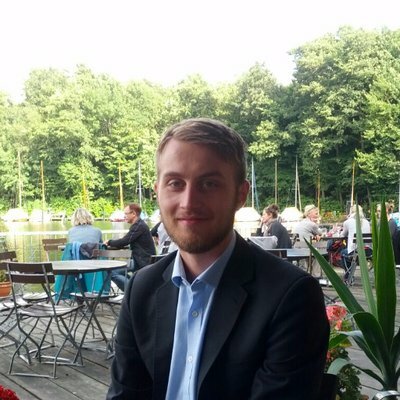 Philipp Lottholz is a PhD Candidate in the International Development Department, University of Birmingham. His research focuses on peacebuilding and security practices in post-Soviet Kyrgyzstan and social change in post-Socialist Central Asia and Eastern Europe. He is particularly interested in developing decolonial theoretical perspectives and collaborative research methodologies in this context.